The public light bus (PLB) was introduced in 1969 with a view to regulating the illegal operation of minibuses at the time. The total number of PLB's has been restricted to 4350 since 1976. The limit is reviewed every 5 years and is to be extended for a further 5-year period from June 2016 until 20th June 2021 following consultation between the Transport Department and the PLB trade. At the end of 2018 there were 4323 licensed public light buses (PLB's). There are about 175,000 holders of valid full driving licences for PLB's and holders are allowed to works as either a green or red minibus driver. Daily patronage is about 1.86 million passenger trips. The seating capacity was originally 14 but was increased to 16 in 1988. From mid-2017 minibus operators have been given the discretion to increase the seating capacity by up to 3 additional seats to a maximum capacity of 19 and all new green minibuses registered from 15th August 2017 have 19 seats other than green minibuses providing feeder serving the HZM Bridge Passenger Clearance Building which have 17 seats to allow for additional luggage space. With regard to existing minibuses PLB operators are able to use their own discretion as to whether to increase the number of seats and by how many and also to decide on implementation date for any increase. The first 19-seat minibuses were introduced into service on 9th August 2017 when 3 retrofitted long-base model green minibuses began operating on three routes. Three low-floor wheelchair accessible minibuses being built by British manufacturer Optare are to operate on a trial basis on selected hospital routes with the first bus being trialled on route 54M (Kennedy Town Station - Queen Mary Hospital) from 26th January 2018. The minibus service was borne out of the 1966-67 riots when 9-seater taxis restricted to the New Territories began illegally serving passengers in urban areas during a bus drivers strike. In 1969, when stability returned, by way of acknowledgment of the driver's contribution, the government allowed them to operate in urban areas. Some of these taxis had a red stripe down the side and they evolved into the red-top minibuses seen since the introduction of the green-top minibuses in 1972. 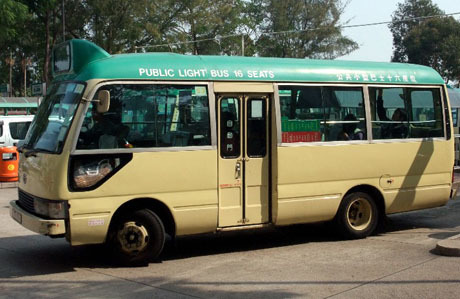 The government introduced the PLB scheduled service (ie Green Minibus or "GMB") in 1972 as an addition to the "Red Minibus" (RMB) which has no scheduled route and can adjust services and fares to suit demand. Green Minibus routes, schedules and fares are controlled by the Transport Department. Green Minibuses are also referred to as "Maxicabs" although less so nowadays. PLB's serve most areas of Hong Kong Island, Kowloon and the New Territories with just a few restrictions to areas of operation. Although the basic function of PLB's is to provide services to areas where patronage would not support high capacity carriers some services do partially or wholly duplicate franchised bus routes and often provide useful “feeder services” to MTR stations and transport interchanges. Where minibuses operate the same routes as franchised buses they generally tend to provide a faster and often more frequent service. Daily patronage of PLB's, as the end of 2016, is about 1.84 million passenger trips. Since the government introduced generous incentive schemes in 2002 many PLB owners have replaced diesel vehicles with new LPG vehicles with the result that much of the fleet is now quite young. Incentives were also offered for owners to convert to electric powered vehicles but to date only one such vehicle exists. 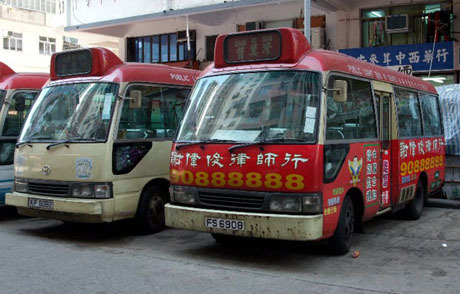 However in March 2010 three companies which operate almost half the entire fleet of minibuses announced they were cooperating with Hong Kong Productivity Council in a study to develop a hybrid fuel-electric plug-in minibus which could cut fuel consumption in half and reduce carbon emissions although the capital cost of the proposed minibuses would be higher than the current LPG and diesel models. Subsequently, in October 2013, twelve hybrid minibuses, developed by local company Green Mobility Innovations, began trials with three green minibus operators. Powered principally by rechargeable electric batteries the minibuses can operate for about 450km at 80km per hour before a small diesel engine kicks in. 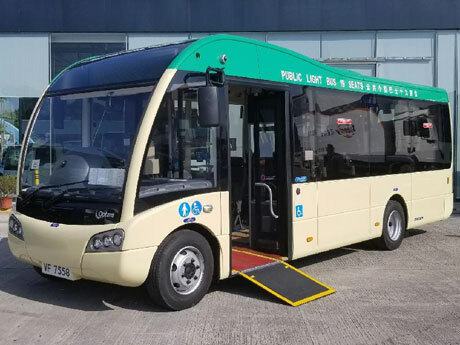 The hybrids cost HK$1.33 million each of which a HK$900,000 contribution for each of the minibuses has been made from the government’s green transport fund. In November 2010 the green minibus operators association made a proposal to the Transport Department that the number of seats be increased from 16 to 20 in return for a three-year fare freeze and discounts for senior citizens. Although the operators indicate there is public support for the proposal it is thought the Transport Department was not at that time keen to adopt the idea. In December 2014 the Panel on Transport of the Legislative Council, however, confirmed that a more recent request from the GMB trade to consider allowing an increase in the maximum number of seats to 20 would be explored in the Public Transport Strategy Study (PTSS) which was launched in the same month. The preliminary assessment revealed differing views between the PLB trade and other transport trades and before making any decision the Government carried out an in-depth study under the Role and Positioning Review (RPR) of the PTSS. A consultant, commissioned by the Government to carry out the study has proposed that the number of seats in both green and red minibuses should be increased by not more than three and, in December 2016, the Transport Advisory Committee confirmed its support for the proposal to increase the maximum seating capacity of both green and red minibuses to 19 and legislation to implement the increase was introduced in mid-2017. From mid-2017 minibus operators have been given the discretion to increase the seating capacity by up to 3 additional seats to a maximum capacity of 19 and all new green minibuses registered from 15th August 2017 will have 19 seats. With regard to existing minibuses PLB operators are able to use their own discretion as to whether to increase the number of seats and by how many and also to decide on implementation date for any increase. The first 19-seat minibuses were introduced into service on 9th August 2017 when 3 retrofitted long-base model green minibuses began operating on routes 101M Tsueng Kwan O - Sai Kung, 20C Tai Po Market Station - Tei Mei Tuk and 4M Shek Pai Wan - Wong Chuk Hang Station. Toyota is the manufacturer of the 19-seat minibus with each vehicle costing HK$700,000. New 19-seat minibuses will also have an extra half-step at the door*, stop buttons at passenger level and seat handrails. Three low-floor wheelchair accessible minibuses being built by British manufacturer Optare and costing HK$1.5m each are to operate on a trial basis on selected hospital routes later in 2017. * The requirement for the intermediate step was withdrawn in July 2018 following a number of reports of passengers tripping on disembarking. In November 2018 the green minibus trade agreed to support a government plan to introduce real-time arrival information via a mobile app. The Transport Department will appoint a technical consultant and a system contractor for conducting a pilot scheme, developing the system and the mobile application, and installing the system. Meanwhile, the department will work with the GMB operators on various types of advance preparation work, which include the setting up of a working group to discuss the details of the system, and compiling the stop information for all GMB services. The initiative will be government-funded and will require around three years for development and testing, with the expectation that the system will commence operation in early 2022. In March 2019 the Transport Department began a trial of a new electronic "Easy Go" fare payment system on Hong Kong Island green minibus routes 8 and 8X (Baggio Villas Lower - Central Exchange Square). Following the trial the Transport Department will assess the operation of the system and discuss with minibus operators the feasibility of introducing the payment system on a wider basis. There are 3295 (at end of 2018) licensed green minibuses all of which are regulated by the Transport Department. They operate on about 350 fixed routes with fixed fares and timetabled services, four of which are cross-harbour services. The average daily passenger patronage, as the end of 2016, is about 1.53 million. Green minibuses operate as franchises controlled by about 30 companies, the largest being controlled by AMS Public Transport which operates a fleet of about 600 minibuses with about 1,500 drivers. At the end of 2015 there were about 8,000 green minibus drivers. Green minibus drivers are company employees with fixed salaries. Several routes can be useful to tourists and the vast majority of buses accept Octopus Card fare payments. A number of routes offer Octopus Interchange Fare Discounts when connecting with MTR trains at some stations. Services are usually frequent and some routes operate a 24 hour service. * with effect from 29th March 2015, 407 green minibus routes served by 127 green minibus operators will be included within the government's "Public Transport Fare Concession Scheme for the Elderly and Eligible Persons with Disabilities", which has been introduced in phases since June 2012 to other public transport, MTR, franchised bus services and local ferry services. The scheme provides for a concessionary fare of HK$2 per journey, or where the original fare is less than HK$2, the original fare applies. As at April 2017 the scheme extends to 522 green minibus routes served by 159 operators. Visitors to Hong Kong age 65 and over can benefit from the scheme when paying fare using Elder Octopus Card. The concession does not apply to fares paid in cash. The destination is displayed on the front of the bus in both Chinese and English (although the English lettering is often quite small and can be difficult to read from a distance). When boarding the minibus the Octopus Card reader is just to the left of the entry doors at the top of the steps. On most routes it is not necessary to pay immediately on boarding (although most passengers do) and is acceptable to take a seat, find your Octopus Card or coins and pay as soon as possible during the journey. If paying with coins drop the exact fare in the coin box just to the left of the driver (no change is given). The seating arrangement for *16-seat minibuses is four single seats on the left side of the bus and six double seats on the right hand side. Several seats are directly over the wheel arch have restricted leg room. *From mid-2017 minibus operators have been given the discretion to increase the seating capacity by up to 3 additional seats to a maximum capacity of 19 and all new green minibuses registered from 15th August 2017 will have 19 seats. With regard to existing minibuses PLB operators are able to use their own discretion as to whether to increase the number of seats and by how many and also to decide on implementation date for any increase. The first 19-seat minibuses were introduced into service on 9th August 2017 when 3 retrofitted long-base model green minibuses began operating on routes 101M Tsueng Kwan O - Sai Kung, 20C Tai Po Market Station - Tei Mei Tuk and 4M Shek Pai Wan - Wong Chuk Hang Station. 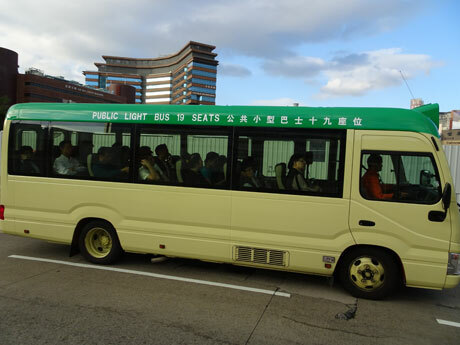 Toyota is the manufacturer of the 19-seat minibus with each vehicle costing HK$700,000. New 19-seat minibuses will also have an extra half-step at the door, stop buttons at passenger level and seat handrails. At the end of March 2018 there were 380 19-seat green minibuses in service including 166 converted from 16-seat long wheelbase vehicles. Three low-floor wheelchair accessible minibuses being built by British manufacturer Optare and costing HK$1.5m each are to operate on a trial basis on selected hospital routes with the first minibus beginning trials on route 54M (Kennedy Town - Queen Mary Hospital) on 26th January 2018. These minibuses can accommodate one wheelchair with a telephone reservation service available from fourteen days to one day in advance. The trial will be reviewed at the end of 2018. In October 2018 17-seat green minibuses, were introduced on new route 901 operating a circular service between Tung Chung North and the Hong Kong Port of the Hong Kong - Zhuhai - Macao Bridge. The fleet comprises both new vehicles and conversions of existing long-wheelbase vehicles and the restriction to seat capacity is to allow for additional luggage space on this service which is frequented by mainland and overseas visitors. All minibuses registered on or after 1st August 2004 must be fitted with seat belts which must be worn. By July 2010 about half of the total minibus fleet were equipped with seat belts. Police occasionally mount operations to reinforce the wearing of seat belts and during 2010 there were 2565 prosecutions. In a typical operation on 8th July 2014 police issued 215 summonses and 14 verbal warnings to passengers and 12 fixed-penalty tickets and one summons to drivers. A further safety initiative, which was introduced from August 2004, is that all new minibuses are fitted with high-back seats. Large display speed indicators are now mandatory inside buses in order that passengers can monitor that the legal speed limit is not being exceeded and the bus operators “hotline” number must be displayed inside the vehicle. Following a number of serious accidents involving speeding minibuses all new minibuses (both green and red) introduced from the end of 2009 were required to be fitted with speed governing devices. Existing buses were also required be fitted with the devices by the end of the first quarter of 2011 and, in October 2009, 110 minibuses operated by Express Top Industries on three routes became the first such buses to be retro-fitted with devices limiting speed to 87km/h. In April 2012, new legislation came into effect, limiting the maximum speed of minibuses to 80km/h and, with effect from 1st December 2014, all newly registered minibuses must be fitted with an approved electronic data recording device (black box).The legislation also requires PLB driver identity plates to be displayed and requires applicants for a PLB licence on or after 1st June 2015 to attend and complete a pre-service course. The police have taken a strict approach to the new PLB safety legislation and in unannounced operations deploy Motor Vehicle Examiners to conduct on-the-spot examinations and plain clothes officers on board to observe the driving manner of PLB drivers. In a typical operation conducted on 18th September 2012 police checked 280 vehicles and issued 75 fixed penalty tickets as well as 110 summonses against PLB drivers for various traffic offences including failure to display a driver identity plate, speeding and failure to comply with traffic signs. In an initiative to improve PLB safety, with effect from 1st June 2015 all new Public Light Bus driving licence applicants are required to complete a pre-service course before being issued with a licence. The 16-hour course covers PLB operations, occupational health, PLB structure, safe driving and road safety, major contributing factors for traffic accidents and handling emergencies, customer services and handling complaints, and other items. Participants who have completed the course and passed the course-end assessment are issued with a course certificate issued by the designated pre-service training schools. Interior of a green minibus. Speed indicator is visible in front of top left of windscreen and Octopus Card reader can be seen just below to the left. The coin box is located below and behind the Octopus Card reader. Travelling to the final destination of the minibus or disembarking at an intermediate stop where other passengers are disembarking is no problem for visitors. However the majority of buses have no bells (although bells or buzzers are being introduced on some new and existing buses on certain routes). Passengers need to attract the drivers attention when wishing to disembark at the next stop and need to shout out to the driver. If sat at the back of a noisy minibus it can sometimes be difficult to be heard and for passengers without a loud voice or who may be embarrassed by shouting are advised to try and sit near the driver. Most drivers do not speak English but usually do understand English commands such as "next stop please" and it is not necessary to communicate with driver in Cantonese. Shouting just about anything will indicate to the driver you want him to stop and most drivers will usually acknowledge requests to stop with an arm motion. If waiting to board a bus at an intermediate stop and the bus is full the driver will usually give a hand signal to waiting passengers and not stop. However, most green minibus services are frequent and waiting passengers can normally expect the next bus to be not too far behind. There are 1028 (at end of 2018) licensed red minibuses. These include 1032 16-seat minibuses and 37 19-seat minibuses introduced since the passenger capacity limit was relaxed in August 2017 of which 36 are new and one is a conversion from an existing 16-seat long wheelbase minibus (at the end of March 2018 the number of 19-seat red minibuses was 74 including 8 retrofitted 16-seat vehicles. Red minibuses are unregulated, may set their own fares and are not required to operate fixed routes or timetables. 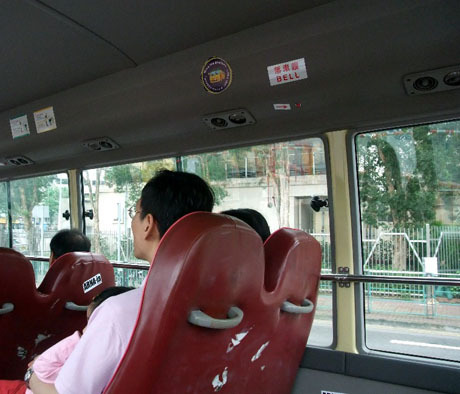 Drivers are either owners or rent at a rate of about HK$800 a day (at mid-2016).Most red minibuses only accept fare payment in cash, although the number accepting Octopus Card is steadily increasing. When paying by cash, fare can be given to the driver on disembarking from the minibus and drivers are usually able to give change. Fares are determined by the driver and can increase sharply when demand is high such as during adverse weather conditions. 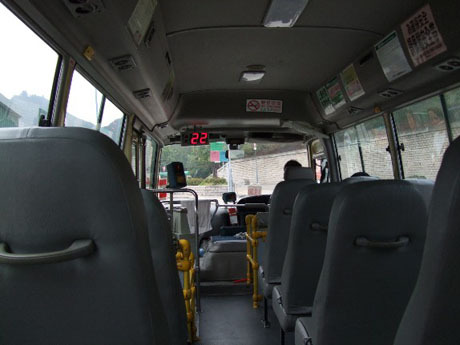 Red minibuses operate on about 75 routes but are not particularly "visitor-friendly" for tourists to use and although they do operate in some areas not served by green minibuses or franchised buses are not recommended for occasional visitors to Hong Kong. There are currently government proposals to convert red minibuses into regulated green minibuses. Daily passenger patronage of red minibuses, as the end of 2016, is about 308,100.